A for Ahlmann, A for Allianz-Preis – Christian Ahlmann already finished first in the 1.55-metre jumping competition with a winning round in 2017 with Caribis Z. Precisely one year later he repeated this victory. It took Christian Ahlmann and the just eleven-year-old Caribis Z 47.75 seconds to cross the finish line in the winning round. 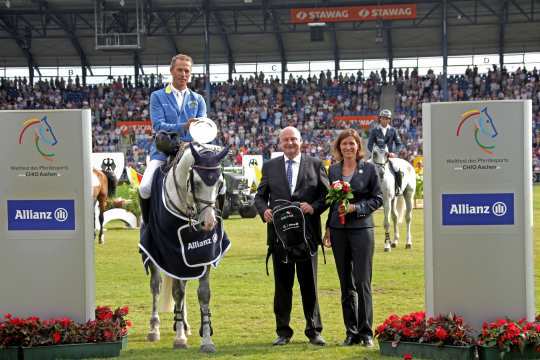 The clock stopped at 48.04 seconds for Hans-Dieter Dreher and Berlinda. Luciana Diniz (POR) and Camargo came third in a time of 50.34 seconds. Ingrid Klimke mit Hale Bob beim DHL-Preis beim CHIO Aachen 2017. Copyright: CHIO Aachen/ Arnd Bronkhorst download Dem Sieger gratulieren ALRV-Aufsichtsratsmitglied Stefanie Peters und Dr. Hans-Jochen Schübbe, Leiter der Vertriebsdirektion Köln, Allianz Deutschland.